For Isabella Dearborne it’s the first ball of the season and she is eager to dance with handsome Mr. Harrison–if only he’ll ask her. But when her elder sister, Amelia, rudely spurns her suitor, Mr. Croswell, Isabella dutifully steps in and takes her place. Soon, Isabella begins to see that neither gentleman is quite what she imagined at the beginning of the evening. 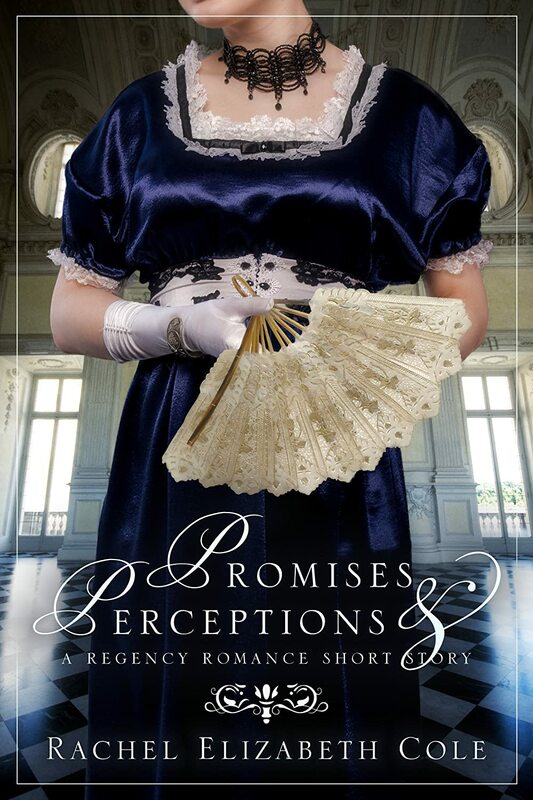 Promises & Perceptions is a short story of 4200 words or about 15 pages in the inimitable style of Miss Jane Austen. I think the biggest difference is the amount of research involved. You need to be familiar with the mores and manners of the time, the way people lived their lives, and the language. The English language has changed a lot in the last 200 years, so there’s a lot of work involved just making sure you’re using the right words! 1. Read lots of books, especially in the genre you’re writing in. 2. Write a lot. And I mean A LOT! Practice makes perfect! 3. Find a good critique group. Giving critiques is as vital to improving as a writer as receiving them. It helps you think critically about what makes a piece of writing work and what doesn’t. Quite simply, I adore Jane Austen and the Regency period. I dearly wish she’d live longer to have been able to share more of her wonderful stories with us. Writing my own has been an attempt to fill that void. Rachel Elizabeth Cole writes a mix of genres–from heartfelt literary and women’s fiction, to laugh-out-loud chick-lit, to quirky contemporary middle grade fiction. Her short stories have appeared in literary magazines both online and in print, including Cahoots, Literary Mama, and Flashquake. When she’s not writing, Rachel works as a graphic designer specializing in book covers. Her favourite season is autumn, she prefers tea to coffee, and she wishes every morning began at ten a.m. Even though she hates the rain, Rachel lives just outside Vancouver, British Columbia, with her husband, their two sons, and two very spoiled house rabbits.